For a basic table, click Insert > Table and move the cursor over the grid until you highlight the number of columns and rows you want. For a larger table, or to customize a table, select Insert > Table > Insert Table. 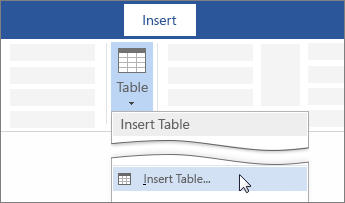 If you already have text separated by tabs, you can quickly convert it to a table: Select Insert > Table, and then select Convert Text to Table. You can even draw a table: Select Insert > Table > Draw Table.